Also known as the Administration Building, the four-storey Angeles Hall was built in 1982 and currently holds the executive, administrative and academic offices, St. Cecilia’s Auditorium, Our Lady of Grace Chapel, language and engineering laboratories and other business units. The five-storey AUF Professional Schools opened in 2004 and currently holds the School of Law, Graduate School, Confucius Institute and the College of Business and Accountancy. The north and south wings also house the St. John Paul II Halls, two libraries and classrooms. The five-storey Twin Buildings were inaugurated in 1994 and currently house the School of Medicine, Colleges of Nursing, College of Allied Medical Professions, science laboratories, lecture rooms and classrooms. Students enrolled in Medicine and other health sciences programs obtain their clinical training at the AUF Medical Center, the only private tertiary teaching, training and research hospital in Central Luzon. The ITTC houses the College of Computer Studies, Management Information Systems Services and the computer laboratories. It was funded by the USAID-Association of Schools and Hospitals Abroad (ASHA) and inaugurated in 2000. AUF is the only university in Central Luzon with a four-storey library building donated by the USAID-Association of Schools and Hospitals Abroad (ASHA) and inaugurated on December 4, 1987. Supported by three other satellite libraries, the University Libraries hold 103, 682 volumes of books and non-print materials, 5719 research outputs and 116 titles of periodical subscriptions, based on a May 2015 inventory. The Our Lady of Grace Chapel serves as the prayer room of students, employees and guests where the Holy Mass is celebrated regularly. It was blessed and inaugurated on December 4, 1992 and named in honor of the Blessed Virgin Mary whose intercession has brought AUF countless blessings and graces. The AUF-SCC includes an events hall and state-of-the-art Gared Pro basketball goals and Robbins All-Star Maple basketball floor used in the best arenas of the NBA which was donated by the late Dr. Emilio T. Yap. 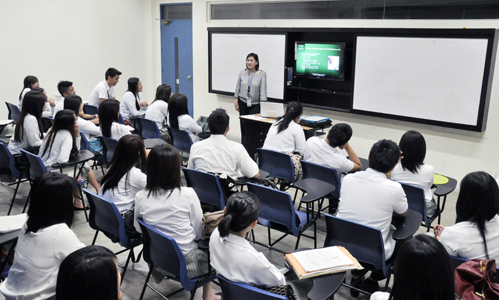 Air-conditioned classrooms are equipped with built-in flat monitors or LCD projectors, while discussion and lecture rooms have built-in LCD projectors and screens. Mandarin classes are held in this modern language laboratory which also serves as HSK Online Test Center. It was donated by the Confucius Institute Headquarters/Hanban and inaugurated on July 24, 2015. AUF is one of the very few in the Philippines with a computerized language laboratory used for speech classes. The DSP Laboratory provides skills training to Electronics Engineering and Computer Engineering students. This facility was donated by Texas Instruments in 2006. The AUF Smart Wireless Engineering Education Program (SWEEP) Laboratory aims to raise the level of technology and engineering education, particularly in the field of Electronics and Communications Engineering. 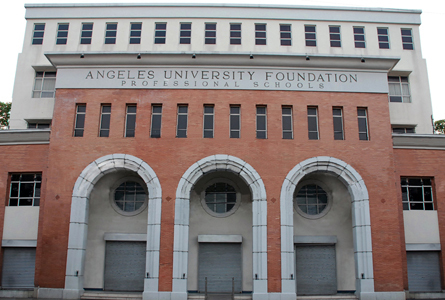 Inaugurated in 2003, it is part of the industry-academe partnership launched by Smart Communications. AUF is the only one with a hotel kitchen laboratory considered as the gold standard in HRM education. 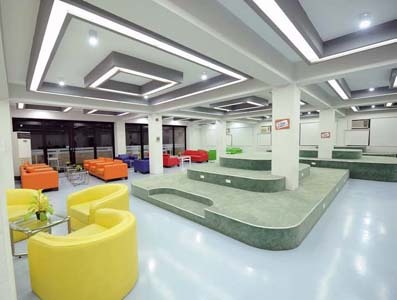 AUF is the only one with a Learning Commons, a Wi-Fi educational space designed to suit the needs of today’s learner. This four-hectare property includes the AUF Museum, football field, cover court and sprawling greens. It was donated to AUF by the heirs of Don Emiliano T. Valdez in 2004. AUF operates secured, well-furnished and Wi-Fi ready dormitories in three different sites that can accommodate a maximum of 355 residents.